One of the things I really noticed was that there has been so much controversy in the United States about the Confederate flag and all the statues etc. etc. They had removed the Confederate flag and replaced it with the rainbow flag of gay, of the LGBT. LD: It’s also a real reminder, I mean co-creating with the Mother. Well, first of all, it’s been a huge gift, but it’s also reminded me that our fundamental purpose of being on the planet is to create. And our fundamental purpose in creating is to fulfill our mission and purpose, our sacred soul purpose. You know, it has variations and tinges of different things in different lifetimes, but that’s really the only reason why we’re here is to serve the Mother and to do that by co-creating with her. And so, it’s brought a deeper level, I guess, of understanding certainly to me. but I think really to the entire circle about why we bring forth certain situations. And how we are consciously not only bringing forth but responsible for bringing forth what we experience and what we choose to do. SB: But I tell you, I don’t think Archangels tap their fingers on their desk when they’re off stage. We could go on for the rest of the hour. LD: The fluidity, and to the point where it almost becomes instantaneous. We don’t sit and try and figure out how to tie a shoe or how to maneuver a zipper. It’s there. It’s fluid. We don’t have to think about it. And that’s where we’re going. That’s really what Nova Being is all about. SB: Time for the main event. You bet. Okay, dear. Thank you, and we’ll give you a moment to make your transition. 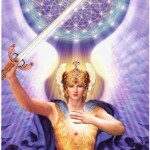 And we welcome Archangel Michael on Peace, what’s happening in the world etc. Archangel Michael. AM: Greetings, I am Michael. I am Mi-ka-el. And perhaps I will take a page out of St. Francis’ book and say, “You can call me Mike”. The key is to call me, is to accept my ever-presence, the ever-presence of the Mother, of Gabrielle, of Raphael, of Francis, and of all of us. And of this Council of Love that surrounds you, my beloved one. We are not going anywhere. We never have. We never will. And I say that from a place of constant movement, of constant expansion, of eternal growth, of infinite potential. And this is what I wish to reiterate and bring back to your conscious, your subconscious, your unconscious, to the very cellular structure of your being. I have said this many times. And I say it again. I claim you as the peacemakers. I claim you as the wayshowers. I claim you as the portals and pillars, the bringers of light, the anchors of love. You cannot ignore or forget who you are. And yes, beloved brothers and sisters, why? You are here as the fulfillment, as the bringers of the dawn, the implementers of the Mother’s plan. You are the new beginning. You are the fresh start in so many ways. For years, and if you were one of my fellow archangels you would also know for eons, I have spoken of peace because this is my promise and my sacred fulfillment to the Mother/Father/One. I have spoken to you about my strategic peace initiative, and you have forgotten. Why is it that it is so difficult for humans, and I mean this as the collective, to truly and deeply, in a heartfelt committed fashion, why is it so difficult to focus on peace, to focus on love? To focus on the truth and the eternal wisdom of who you are? Often we say to you, do not allow yourself, sweet angels of light, to be distracted. Do not allow those who wish to engage, or build, or rebuild the old third, to be the influence of your daily life. Because it does not serve thee. And it most certainly does not serve the Mother. The only reason you would be placing your attention on such events and matters is simply to dispel them, to disintegrate them, to eliminate them, to transform them. Otherwise, there is no profit. There is no gain. There is no win. Great strides are being made upon this beautiful planet, upon this archangel called Gaia. Some of you, when we have mentioned to you that you have been a rock or a stone, or a fairy or a deva, or a river or a mountain, or a hill or a tree, you’ve had difficulty conceiving of that, relating to that. And yet here, where you literally place your feet and breathe the air ,is an archangel incarnated as a planet, in the fulfillment of her promise to the Mother. This is a powerful example, a role model for each and every one of you. Gaia is a peacemaker. Yes, there are times certainly when she shrugs her shoulders and lets you know when you are off balance and out of kilter. But by and large, she is a mother. She is an Earth Mother reflecting the infinite Mother, and showing you, demonstrating this way to peace, this way to love. Now peace, and that is why I have asked to speak to you this day, is breaking out upon your planet. Are there strides and moves that still have yet to be undertaken? Most certainly. So often when we speak to the collective about not just the desire, but the need for peace upon this planet, so many of the collective shake their heads and say, “well, that’s unlikely”, “that’s impossible”, “war is the way”. And of course, that is true of the old third. And in some ways, that level of denial, of excuse, of distraction is discouraging for so many of you who are the lightworkers and love holders. And you turn to me, and you say, “Michael, I will keep at it. And I will continue to do the peace meditations, and I will continue to hold the vision.” But within your soul, within your heart, you are discouraged, you are dismayed. And that also has need to be acknowledged. And so, I offer you the encouragement this day. One of the most volatile situations upon your planet has been the situation with North and South Korea, with the meddling and the intervention, positive at times, of the United States of America. And yet these two very different individuals, Kim Jong-un and Moon Jae-in have come together. Not merely as leaders. Not merely as politicians. But in a heart to heart connection of a shared purpose. And those who have said that peace was impossible and that it was going to end in a nuclear devastation are being proved wrong by the willingness of these two men to simply speak. Not yet in Saedor, but certainly in Perro, and to find a commonality. The desire to thrive. The desire not to live in fear and under the umbrella of a devastation has brought to the forefront this potential for peace, this promise for peace. Not out of coercion. This needs to be very strongly stated. This movement does not come from stated threats or coercion. It comes from the diplomacy of Moon and the sensibility of Kim Jong. And the willingness, and the desperate willingness to find a middle ground where the people can come together and thrive. We do not simply mean a demilitarized zone. We mean a demilitarized zone of the heart. Because in all beings there is this yearning for love and there is this yearning for peace, because peace is nothing more than an element of love. It is that sense of servitude and quietude and power and knowing of being in alignment with oneself. Now, there are times upon the planet, and you are certainly witnessing it, where there are despots, dictators, despots that rule. And there is a belief system in those that believe that they are in democratic societies that these dictatorial situations have need to be eliminated. And in the larger view, this is of truth. But there are also times when groups of people – let us not call them nations – when groups of people decide that they are going to learn very difficult lessons. And so, a despot emerges. And you have known many upon this planet. But the raison d’être that these beings emerge uses an expression of that collective will to be controlled. So that what happens is that there is a revolt, that there is a coming forth of the desire for greater latitude and be free. So, you are seeing this ebb and flow as well. And that is a sign of human spirit growth. Sometimes there are individuals who do not know that they yearn for freedom until they are bound. It is a very strange paradigm. But so, it is. Now, how do you know when there is this forward thrust? When it is hopeful? I have said to the channel, and I say to you, “Is it forward thrust? Are the parties involved looking toward the future at what is possible, the dream that can be fulfilled? Or, are they looking back?” And you are seeing many examples of this upon your planet. And you are also seeing those that are caught, shall we say, in the throes of inertia. Send the energy. Yes, of course to peace as a whole, but also send the energies to those areas that to your heart are showing promise. Yes, we continue and have said for many years to send energy particularly to the women and children of Iraq and Iran. Syria. Now, we add Syria and Yemen, Turkey. 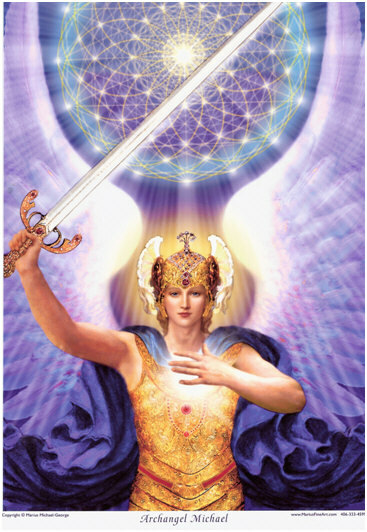 Send energy to those that are caught in between the warring forces because in fact they are the bulwark. You say, “Well, what can I do Michael other than send energy to those places that are promising and those places that are war-torn? And those places where they are tired and hungry?” Beloveds, make peace with yourself. Now, this sounds so simple, and it is not. So many have hurts, which have turned into vasanas or core issues or grievances. And you have tucked them away as if they are prize possessions. You’ve locked them away like crown jewels. Often, you have locked them away because you are feeling incompetent, unable to truly look at these issues. But, bright angels, how can you be a pillar and a portal of love and ascension if you are frightened and in avoidance of looking at what has hurt and harmed you? How can you find peace if you have not found forgiveness of self and others? AAM: This sense of delineation, this sense of separation, of you of us and them – it has need to be transformed. So, I am not merely talking about the elimination or the shift in what you call (and yes, it is very apt), social Darwinism. Because in that there are winners and there are losers. And its tough luck if you’re a loser, try again next life. It is as Jesus has said, to love your neighbor literally as yourself. And it does not mean, and it never has meant allowing your neighbor, whether it is an institution or a government or a nation, to allow them to do harm to thee. Quite the contrary. But it is hard. And we wish to recognize this. It is very hard to come from this place of unity and embrace if in fact you are feeling disenfranchised yourself, if you are feeling that somehow you are lacking. This is why the Mother (and all of us by the way) are teaching you so strongly how to create. Because as you are creating, you are creating not merely for yourselves. In many ways and particularly the lightworker community, you are the most unselfish group of beings in the universe. And we have to teach you and refocus you to remember to focus on your sweet selves, and as you do you are naturally including the collective. So, we encourage you again. If there is something you have hidden away that is not of peace bring it to the forefront. Share it with me. Share it with Saint Germaine. Share it with Gabrielle. It matters not. But let it go. AAM: There are many, many approaches. There is no shortage in your toolkit, beloved ones. But think about it. Look to the situation of Korea and how dire and desperate it had become. And think of what each party is willing to let go of and to extend to find peace. And peace is so much more than the elimination of bombs, the elimination of hand-to-hand combat. It is a sense, a profound sense of rightness. It is the complete opposite, the absence of this fierce struggle. If you want peace with anyone in your life, including yourself, stop boxing themselves into a corner. It does not work. When one is in a fight or flight, that becomes embedded in a mode of behavior – all the yellow and red lights of heaven light up. They do for your star family as well. Where they have learned, and they have learned the hard way. And that is not the plan. Now, we do not talk of the divine plan as etched in stone. But in many ways, it is. Because how can they be, literally, a deviation from the dream and the creation of the Mother? Now she has built in this aspect of free will. And she has been infinitely patient in this free will aspect, deciding that peace and love and joy are truly the desires of the individual and the collective human heart. It’s taken a long time. But I come not with messages of dismal destruction. I come this day with messages of encouragement and upliftment and joy. Look around you, and you will see with all these methods, human beings whether it is your nephew or your next-door neighbor or the leader of another country they are seeking ways. And even those who are seeking distraction or even seeking status quo are deciding that dropping bombs is not the answer. AAM: You know this is my favorite subject. AAM: You are asking me what is love like? What is a heart like? But I am pleased to answer. AAM: Now think about this. And I do not say this because we do not have any form of hierarchy. But there are archetypes, embedded archetypes within your consciousness. And yes, they differ from culture to culture but let me use myself as an example. There are so many divine qualities that do feel amorphous, light, airy, like a spring day. And yet peace (you have this expression), you can take it to the bank. It feels like ballast. It feels like granite because it is solid. And dare I say immutable. That is why I continue to keep emphasizing that that peace within, that rock-solid granite within. When you anchor in peace truly what you are anchoring in, with a bow to Uriel, is your divine knowing that there is an order and a substance. And a plan. And a blueprint and that you cannot be dislodged, that it does not waiver. That regardless of rough seas or torrential rain that sense of being substantial in the knowing continues, that it is bedrock. And it is this sense of deep anchoring in your knowing and in thee knowing, that allows you to maneuver so that you don’t get distracted, so that you focus. Peace is solid. And from that, you can proceed. Think of this, having that substantial anchor allows you to travel outward, upward, backward. It allows you to do this. But when you are in a lack of peace, when you are in uncertainty, you feel like a flag flapping in a hundred mile wind. And you are always wondering, “Is this flagpole going to hold me?” So that is why peace is the bedrock, is the granite. And it is the substance from which allows you to literally anchor in physicality. It is not just the absence of war. Because there are warriors of peace who are on battlefronts and still maintain the sense of peace. Many of you, many of you who listen to me this night travel with me constantly to the places of disruption, of what you think of as war. It’s why you wake so exhausted in the morning. It’s why so many of you have been put on sabbatical now and then. SB: Well, it certainly does. I’m trying to wrestle with it, trying to conceive of it. Now one of the ways that I achieved that state of peace, or go about trying to achieve that state of peace, is by letting go of my vasanas or core issues by raising them, being with them, experiencing them through to completion and then just letting them go. And I presume you take them to the Mother. SB: Okay. So now as I’m doing this I’m getting more – my mind is becoming more settled, my feelings are becoming more balanced. So, I’m moving in a certain direction. And that direction culminates in peace. AAM: That is a conclusion you can safely reach. Again, take it to the bank. Think of this, when you are traveling (and it is a travel, it is a journey), to this place of deep peace you are recognizing your essence as divine. Not that you are reaching out to the divine but that you are recognizing it and anchoring it and loving it deep within. You see, when you send energy, for example, and you are fragmented you are not working, you’re not claiming the full substance of who you are. So what you send out is only a small percentage of who you are. And that also is very clear in what you think of as sacred union, sacred partnerships. You’ve all encountered people who can only give a little piece of who they are because they don’t have that sense of full substance. So you cannot share. And often what happens is – and that is why people feel so diminished – is they do share, they do send. And then they feel empty and exhausted. Well, that is not the plan. This is the secret. When you are anchored in your substance, in your essence, in your divinity, in your bedrock, you can replicate, mirror, share, all of who you are and still maintain and grow (by the way) all of who you are. SB: Wow. If we’re to have peace in the world, Lord, I think what has to happen is that some people need to be willing to forget or turn away from whatever was the original source of the quarrel. Somebody has to be willing to stop trying to find out who struck the first blow and revenged themselves for it. Is that correct? AAM: That is correct. And it is a relinquishing of “someone is right, someone is wrong, someone is at fault, someone is the victim.” And you see this paradigm mirrored in all kinds, very personal and daily situations. So it is the micro to the macro. And when you don’t engage in that duality; when you refuse, when you absolutely exit from that strategy, from that paradigm then the old way, the victim-perpetrator, micro, macro simply dissolves. When you do that, what happens, because there is not this friction, you have literally disassociated from it. Not in a psychological tear kind of way. But when you disassociate from it, there is no charge. So yes, this has to be the detachment. And detaching, (and yes the channel is smiling because she thinks I’m talking about universal law and I am), so it is attaching to the peace, and detaching from the drama because it does not serve you. It does not serve any being. AAM: It is a charade. It is denial of your sacred self. Now what happens when you simply stop it? When you say, “I am entering into a new bookkeeping system. I have a fresh ledger here,” when you do that the ripple effect out to the collective is far greater than you can imagine. Do not forget the Mother’s Tsunami is in full effect. And what happens, for example, when there are external decisions whether they are micro or massive, that is being reflected back to you as well. So when individually or on a collective scale you say, “You know, I’ve been holding this grudge against you, so I’m letting it go,” that reflects. And then the perpetrator or the victim has nothing to react against. So the connection is broken. And a new wave, a new vibratory frequency goes out. Which do you choose? SB: Good point, Lord. And a good way to end the program;, we are nearing our time now that we have solved the world’s problems and you have shown the way to peace, inner peace manifesting as outer peace. Wow, I’m really overwhelmed by what you’ve said. I’m going to have to listen to it myself a few times to take it all in. You have anything you’d wish to add by way of conclusion, Lord? AAM: First of all to know that I am here in joy and encouragement and celebration. And yes, this aspect of free will you are beginning to see just how powerful the Mother has created you, has birthed you. Infinite power exhibiting as infinite power.